Today I got to work a rare early Saturday shift. Through my entire time teaching, I have always worked the late shift on Saturday. Most teachers work early Saturdays, and then get started on their evening activities while I am still at the office. Conveniently, there was a summer festival in Atami. Koalako invited me and some of the other teachers to come to the festival. We all met up and took the train to Atami. I had never been to a summer festival before, so I didn’t really know what to expect. We walked through the hilly streets of Atami to Koalako’s house. I had met her parents earlier in the ear at a really fun karaoke night. They greeted us all with beer and sushi, which is a pretty great way to greet people. After eating, we were provided with Hapi Coats (a short robe) to go to the festival. As we approached the main street of Atami, we saw throngs of people on either side of the road cheering on the giant floats that were being pulled down the street. All of the floats had lights and decorations, and were full of people drumming, playing instruments, and singing loudly. It was a crazy atmosphere. We followed Koalako down the street through the crowds. I expected that we were going to find a spot and watch the parade. However, I was surprised when she lifted up the barrier rope and called us into the street. Not wanting to be left behind, we followed her as she walked up to one of the giant floats. At the front of the float was a team of people in summer festival gear holding on to a large rope used to pull the float through the streets. Koalako introduced us, and her friends made room on the rope. Yes, we were now part of the team pulling the float through Atami! We pulled the brightly lit float while everyone inside made lots of noise, entertaining the crowd and competing with the other floats. Occasionally we would stop to jump around and dance, and generally try to make even more noise. Thankfully my years in the fraternity had provided great training for jumping around and being noisy, so I fit right in with the crowd. By the time we finished and parked the float, we were drenched in sweat. High fives were exchanged, beer flowed freely, and giant bottles of water were poured over heads. 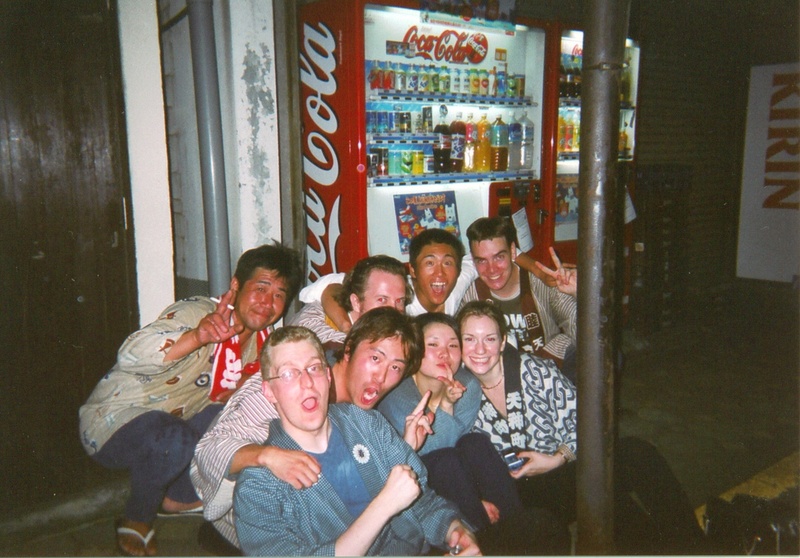 As we walked back towards the train station, we all agreed that it was one of the most fun nights we had ever experienced in Japan, and we hoped to do it again next year! This entry was posted on July 16, 2015, 8:00 pm and is filed under Life in Japan. You can follow any responses to this entry through RSS 2.0. You can leave a response, or trackback from your own site.